"It is my pleasure to write this letter of recommendation for our realtor Mr. Michael Call. Michael was instrumental in helping us purchase a new home in Huntington Beach, California. Michael is from Huntington Beach and he possesses extensive knowledge of the neighborhoods and schools in Huntington Beach as well as in many of the surrounding cities. Having come from Phoenix Arizona, we had no idea which neighborhood would work best for our family, but Michael took the time to show us several great family neighborhoods with amazing schools. He also showed us many homes in these areas, but never rushed us. Instead he carefully listened to what we liked and disliked from each of those homes until he was able to find us the perfect home. In fact, it was Michael’s history as a great realtor in Huntington Beach that helped us locate our new home. Michael is well organized, creative, and he is constantly looking for ways to help his clients find the home of their dreams. With all of his real estate skills and knowledge however, Michael’s greatest assets are that he is patient, thoughtful, a great listener, and an advocate for his clients. He is the only realtor that I have worked with who took the time to call the home warranty company when our furnace stopped working and he personally saw to it that we were reimbursed for repairing the furnace. Michael has an excellent understanding of real estate practices in California. Michael has impeccable character; he is intelligent, honest and extremely hard working. It is my opinion that Michael Call is a person who is very proactive, and he has the ability to help you find and purchase an amazing home. It has been a wonderful experience to work with Michael Call and I will not hesitate to recommend him to others looking for a new home in Southern California." Cean R. Colcord Ph. D.
"Michael Call did an excellent job selling our home. He came to look at the home before it went on market, made recommendations which we followed through with and within that week of listing we had an offer. Once the process began, Michael was very diligent in tracking all aspects of the sale. He made sure all items got into escrow, let us know when items where due and followed up quickly on any questions or requests that were made. He continually checked in with us to make sure the process was going smoothly. Michael always responded to any email and/or voice mail that was sent very quickly. We highly recommended using Michael for your home purchase or sale, knowing he will do an excellent job for you." 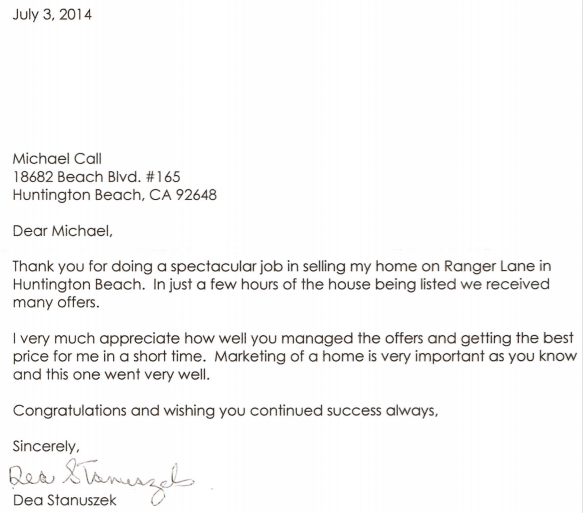 "Dear Michael, We want to thank you so much for your ability to sell our property at 712 Utica, Huntington Beach. We interviewed five different real estate agents before we selected you. You were the only one who gave a caring, professional presentation. And you felt we could get more than the $500,000 the other agents had determined. Instead you sold the property for $712,500. within two months. We appreciate working with you and we hope to do so again in the future." "Working with Michael Call as our realtor was a true pleasure. Throughout the entire process, his manner was professional and pleasant. When we sat down to solidify the listing, he presented a bound packet reflecting thorough research of comps on the area as well as recent sales activity. His intimate knowledge of this particular complex made establishing the listing price quite easy. Soon, he had sent out large-scale post cards advertising the condo, and the picture he selected was eye-catching, garnering much attention. Several interested parties viewed the property right away, and within 5 days a solid offer was made. The escrow closed in just over a month! We would highly recommend using Michael Call for all your real estate needs"
"I would like to thank Michael Call for being a helpful realtor, broker and friend. Michael has successfully guided my mother and I through a sale of a home and the purchase of a 4-unit apartment in Huntington Beach and a 12 unit apartment in Buena Park. Michael's many years in the real estate business made our experience easy and less stressful than other realtors I have worked with in the past. Considering this was the first time my mother and I have purchased units other than single family homes Michael's knowledge, professionalism and business contacts were essential in enabling us to expand our real estate investments." "This is a note of appreciation for a job well done on the sale of 525 15th St. your guidance in preparing our property before putting it on the market resulted in a quick sale. Your open house generated interest in several prospects, one of whom was the eventual buyer. Your knowledge of and advice on a 1031 exchange has saved us a significant amount of money. I am happy to recommend you to any potential customer." "I was so fortunate to have received Michael Call's name from a friend of mine. When I first started looking for a home I was unsure. Mike's experience and total knowledge made me feel at ease and very comfortable with this unfamiliar process. I have no hesitation offering his name to anyone who is looking for a Realtor." "I have referred three of my neighbors to Mike. All have spoken very highly of his professionalism, consideration and marketing skills. I personally like Mike and refer all my friends and neighbors to him." "Our Home was recently sold by Michael Call. I want to write to simply tell you that my husband and I thought Mike did an excellent job. From beginning to end he was professional, cordial and he got the job done." "Thanks Mike. First, you helped me package the development of my home downtown with a local builder. then, when I decided to sell, you gave me a written personal commitment and marketing plan. Probably the aspect that personally helped me the most was the continuous updates of the market and feedback from buyers and other realtors." "Having Mike represent us in the purchase of our home in the downtown area of Huntington Beach was a real pleasure. Then when it came time to relocate he took all the worry about the hassles involved in selling off our hands. He made it a pleasant and positive experience during a difficult period of time." "Mike, you're the best. What a pleasure. You gave us an honest comparative market analysis, listed the home and had a buyer in less than two weeks. I certainly appreciate your skills, helpfulness and would highly recommend you to anyone." Thank you for doing a spectacular job in selling my home on Ranger Lane in Huntington Beach. In just a few hours of the house being listed we received many offers. I very much appreciate how well you managed the offers and getting the best price for me in a short time. Marketing of a home is very important as you know and this one went very well.